This is a picture of Andrew and his 2nd wife Charity DeWitt. It is probably an engagement or wedding photo. Charity (1875-1938) was Andrew's (1850-1930) second wife. They had ten children, seven surviving to adulthood. Another portrait of Abigail & Andrew Bruce. This was taken from a tin-type. I was born of Scottish parentage, July 11, 1850, in the city of New York. My father's name was William Bruce and my mother's name was Helen Scott. They came from Galashiels, Scotland the latter part of the year 1849. They stopped in New York City a while then moved to Rishing, New York. There my father was a foreman in there ossy Dekita (???) in a woolen mill for about two years. From there they moved to Elgin, Illinois where my father had the same position in a woolen mill belonging to Dester 'til the spring of 1856 when they moved to Delaware, Iowa and took a homestead of 320 acres of prairie land their post office was Nugent Grove, Linn county, Iowa. In 1858 father moved about 4 miles to a creek named the Buffalo Creek where he built a flouring mill and dam which he operated in connection with a store 'til spring of 1862 when he sold it and bought a farm near what was called the Stone School House where we farmed a year then he bought a saw mill and water over on the American River at a place afterwards called Troy Mills. During this time there was born to them 3 daughters and 3 sons, our son Robert died when a small boy at the Buffalo Mill 1862. Maggie was born on homestead 1857. William Scott was born at Troy Mills, Iowa. George Bruce was also born at Troy Mills, Iowa. Eliza the oldest was born in Scotland in 1848. I worked in the Sun and grist mills in 1867 father sold out. Father had the asthma so I had all the business to move to Troy Mills and he bought 200 acres of land near Troy Mills, Iowa. There I worked on farm working late and early; working and improving the farm 1870. Till father traded if for 160 acres in Buchanan County 4 miles north of Troy Mills afterwards father bought for me 160 acres near Richard Peyton 120 acres from Henry McKee 40 acres in 1877 when I was married to Abigail Wickham, March 31, 1877. I had labored on farm at home 'til this time when we commenced housekeeping on our farm. We lived on farm 'til spring of 1881. We moved to Franklin, Nebraska and went into partnership with J. H. Fairchild in a shop improved a water power on a small creek near town. We had at that time 2 small boys, C. J. Bruce and W. S. Bruce. The partnership broke up in one season as Mr. Fairchild's wife and little boy was killed by lightening that struck the shop one Sunday when they were visiting. He became discouraged and went back to Iowa. So I continued the shop business over the first winter 'til spring of 1882 when I went into the woolen mill business and continued that 'til March 1884, as the business did no pay. My father settled the business up and we went on a trip to Arkansas. We found the country so very unhealthy we could not stay there. So we went from there to Butler County, Kansas where my cousins James Mosman lived on a farm. About the last of March we had one little girl about 5 months old born at Frontland, Nebraska. My health had been poor and I was discouraged so we stopped at cousins about a month when we moved in to a house we rented at Towanda, Kansas. I worked at carpenter work there 'til fall 1884 about September. When we moved to our farm 7 miles south from Leon in the Brodie neighborhood. 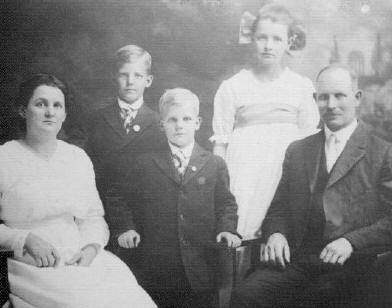 About a week after my wife, Abigail, died with malaria fever then I left the farm and went to my parents in Iowa with my 3 children. I stopped and worked on the farm at home first winter. I worked one winter in a wagon shop at Troy Mills. Then father traded for the Troy Mills again. So I fixed it up and ran it 'til February 12, 1880 when I went to Kansas to improve 320 acres of land in Butler County, 7 miles south of Leon, Kansas. Labored on farm improving till June of the same spring. When I went to run the Troy Mills again was there till March 1, 1887 when I went to Norden, Nebraska where I bought half interest from A. M. Baker in a sawmill on the Niobrara River 7 miles from Norden. I and Baker ran the sawmill and built a 2 run burr-flouring mill. During the summer of 1887 I got it running in the fall the next spring. I bought out Mr. Bakers 2 interest on April 6, 1888. I ran the grist mill till February 13, 1891 when I got married to Charity Isabell DeWitt, up to that time I had kept both my 2 boys with me and daughter Mable May Bruce lived with her grandma Bruce, so I continued the mill business sold 2 interest the burr in company with J. W. Furry 1890 after this 'til I bought his interest about 1900 and took a homestead June 28, 1904 in Cherry county, 5 miles west of Niobrara Mills. William. J. Bruce - Andrew's youngest brother. Note the photo was taken in Center Point, Linn co., IA. Elizabeth "Eliza" Bruce (1848-1929) was the eldest child of William & Helen (Scott) Bruce. 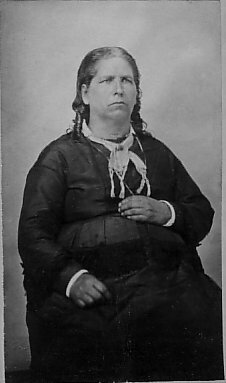 She married John M. Phillips (1843-1930) in Iowa. Eliza died in Troy Mills, Iowa nine months before her husband. Margaret Bruce, William's younger sister b. 13 Aug 1812, bap. 13 Sep 1812, Selkirk, Selkirkshire, Scot. From a post card. That's the William Bruce grist mill ("Hoosier Mills") at the right end of the bridge. 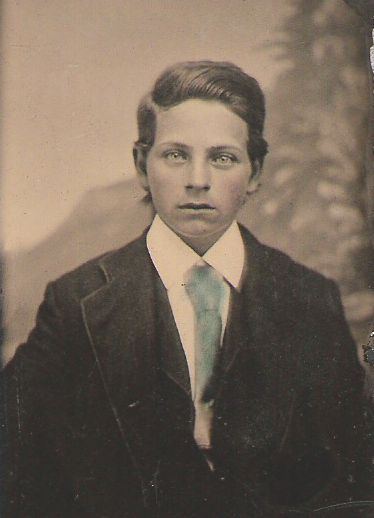 Clarence (1878-1935) was the eldest child of Andrew & Abigail (Wickham) Bruce. 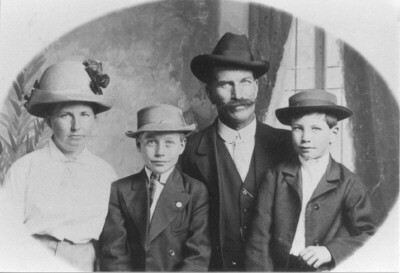 Pictured are his wife, Mamie (Allen), Robert B., Clarence M., Abbie A., & Clarence J. Bruce. A fourth child, Harold J., died at birth. Mabel (1883-1975) was the only daughter of Andrew and Abigail (Wickham) Bruce. Pictured with her are: Lester A., husband Cyrus A. Burley, and A. Lee. Mary C. Phillips, (1876-1916) & husband G. Cyrus Gardner. They married in Linn co., IA. Mary was the daughter of Elizabeth Bruce, grand-daughter of William Bruce & Helen Scott. Mary Ellen Price, daughter of Margaret Bruce, grand-daughter of William Bruce & Helen Scott. She was born in Troy Mills, IA in 1892. This was taken from postcard she sent to a relative. On the back she wrote: "Need anything to scare the rats away? This means sure death to them if they get a glimpse of it." 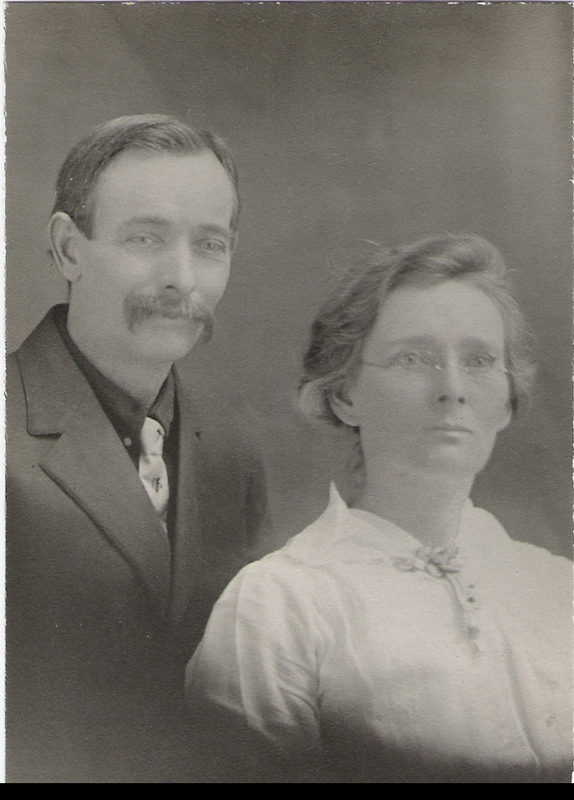 William S. Bruce with his wife, Barbara A. Seaman (1979-1946), only daughter Myrtle G., (1901-69) and on his lap, one of Myrtle's younger daughters. I'd guess it's either Doris or Marjorie. The clothing styles look like 30's vintage. 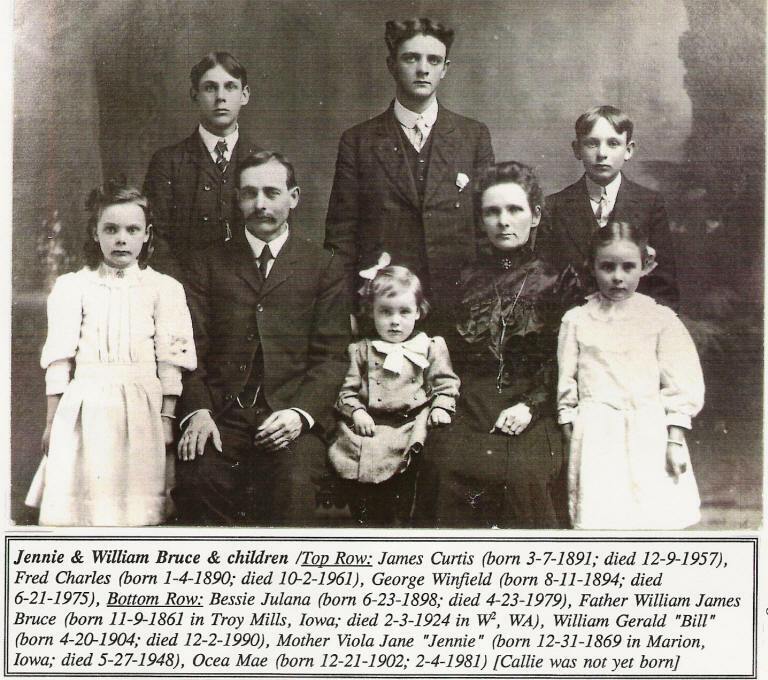 WILLIAM BRUCE was born 19 August 1821 in Selkirk, Selkirkshire, Scotland, to JOHN BRUCE and AGNES PHILIP, and died 27 November 1890 in Troy Mills, Linn, IA. He married HELEN SCOTT 10 June 1845 in Melrose, Roxburgh, Scotland, daughter of ROBERT SCOTT and ELIZABETH BURNS. 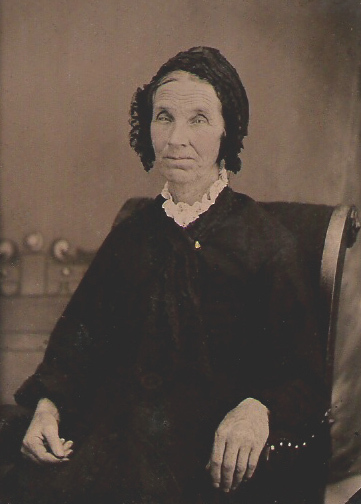 She was born 12 September 1823 in Ancrum, Roxburghshire, Scotland, and died 23 September 1899 in Troy Mills, Linn, IA. Agnes Philip, spouse of the deceased John Bruce, Mason, in Selkirk had a child baptized named William. Born 19 August 1821. In presence of Willm. Philip, stocking maker in Selkirk and Jas. Inglis, Mason, there. Naturalization Record taken from the 1856-1878 book at the Linn County Court House, Iowa: Bruce, William - Declaration Oath before Clerk of Dist. Court of Dubuque County, Iowa, May 25, 1855. Bruce, William - Sworn in open court and admitted to be a citizen of the United States, October 26, 1860. ANDREW BRUCE, b. 11 July 1850, New York City, Borough, NY; d. 05 November 1930, Mollala, Clackamas, OR. Andrews first marriage: Abigail WICKHAM 21 January 1857 at Newtonville, Delaware Co., IA. Second marriage: Charity Isabel DEWITT, 13 February 1891 at Latton, Keya Paha, NE - by Charity's father. JANNET BRUCE, b. 07 April 1855, Elgin, Kane Co., IL, d. 13 March 1863, IA. MARGARET BRUCE, b. 07 July 1858, Hazel Green Twp., Delaware Co., IA; d. 10 August 1893, Henryville, Lawrence, TN. Married Hudson Curtis PRICE, 20 October 1890 at Henryville, Lawrence, TN. ROBERT BRUCE, b. 17 March 1860, Manhalani Mills, Linn, IA; d. 17 May 1860, Post Office Valley Farm, Linn, IA. WILLIAM JAMES BRUCE, b. 09 November 1861, Troy Mills, Linn, IA; d. 28 January 1924, Walla Walla, Walla Wala, WA. 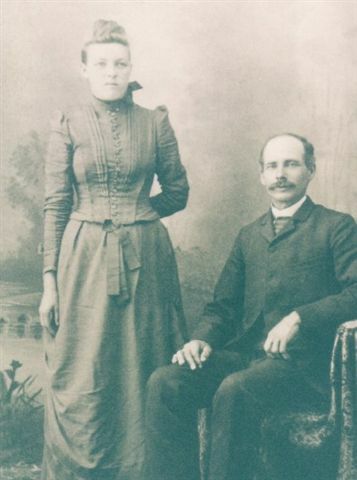 Married Viola Jane (Jennie) PRICE, 15 November 1888 at Washington Co., IA. GEORGE SCOTT BRUCE, b. 18 August 1864, Troy Mills, Linn Co., IA; d. 24 December 1887, Newton Twp., Buchanan Co., IA. William Robert BRUCE was born August 26, 1819 in Galashield, Scotland, and emigrated to America in 1849, landing in New York. He went to Oriskany, Oneida County, New York, where he lived three years, engaged in a factory. 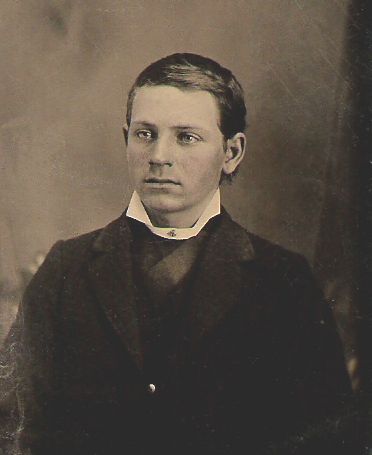 He then moved to Elgin, Illinois, and continued to work in a woolen factory for three years; then emigrated to Iowa, settling in Delaware County, where he bought three hundred and twenty acres of raw prairie. Mr. Bruce built a house and made many other improvements, residing there three years. After several removals and changes of occupation, in all of which he seems to have been fairly successful, he came to Newton township about the year 1870, and purchased the farm on which he now resides, which contains one hundred and eighty acres of excellent land. He is engaged in general farming, has a pleasant home, and is evidently doing well. Mr. Bruce was married in 1846 to Miss Ellen (Helen) SCOTT, of Scotland. They have had seven children---Eliza, born August 24, 1848; Andrew, July 11, 1850; Jenette, March 7, 1855; Margaret, July 7 1858; Robert, March 17, 1860; William November 9, 1861; George, August 18, 1864. Jenette and Robert are deceased. Politically, Mr. Bruce is a Republican, and is highly esteemed. Many small eastern Linn County towns grew up around the grist mills. One example was the Green Mill in Coggon. William BRUCE, in 1858, built a dam and small stone mill on the east bank of Buffalo Creek at the town's present site. BRUCE also operated a store there. The flouring-mill, which was built many years ago by William BRUCE, and known as the Hoosier Mills, is a good three-story frame building, with saw mill attached, having three runs of stone, operated by water power from the Wapsipinicon River. In the early history of the town, the mill played a very important part. It was the driving force that helped to start the town. The area had been surveyed by 1840, but the first settler on record in the area of the future town was a Nathan Haight. Coming from New York State in 1851, he filed on forty acres adjacent to and including a mill site on the Buffalo River. The tract was part of a U.S. governmental reserve set aside for veterans of the Mexican War. In exploring along the stream where it bows to the north, Mr. Haight beheld a spot where the water fell on two large stones. It was called Manhattan Falls. In 1858, it became the property of William BRUCE, an emigrant from Scotland, who entered a half section of land. He immediately began erecting the first flour mill in this part of the country. He built a frame house on top of the hill, a short distance southeast of the mill site and lived there while building the mill. When that was finished he built a stone house in addition to the frame one. Today it is the residence of Marland Schott on Market Street. In the spring of a859, the family moved into the stone house and used the frame building for a general store. Wm. Weeks Sr., a stone mason, with some help, built the mill and stone house. Issac Branch did the carpenter work and Mr. Lennox Sr. assisted. Alexander Rick, known as Sandy Rick, helped in making and installing the flour making machinery. Jacob Clark was the mill-wright. They started grinding soon after the harvest in 1859, and John Morris Phillips brought the first wheat to be ground into flour. The stone mill was located just north of the old railroad station. ...W. J. Bruce, of Idlewild, Minn., arrived Thursday of last week, called here by a telegram notifying him that his mother was very sick. He was accompanied by his brother, Andrew Bruce of Nebraska. ... Andrew Bruce, of Nebraska, who was called here by the death of his mother, Mrs. Helen Bruce, expects to leave for his home Wednesday. His daughter Mabel will accompany him. ....Wm. Bruce Sr. died at his home here on Thanksgiving morning. Death is believed to have resulted from an overdose of medicine taken to relieve asthma.. Andrew Bruce arrived from Nebraska Sunday forenoon, barely in time to attend his father's funeral. here the soul is safe in Heaven. ...Grandma Bruce is numbered among the sick. Mrs. J. M. Phillips, is staying with her and caring for her. ....Mrs. Bruce, of Troy Mills, was buried in the cemetery at West Church Sunday afternoon. The funeral sermon was preached at Troy Mills. ...Mrs. Helen Bruce, an aged lady and an old resident of Troy Mills, died Saturday morning, Sept. 23, after an illness of about two weeks. The funeral was held Sunday afternoon at the M. O. church on the south side, services being conducted by Rev. Keopple. Interment was made in the Hoover cemetery, four miles south of here, where her husband was buried some years ago. Two sons and one daughter survive her, William, of Minnesota; Andrew, of Nebraska and Mrs. J. M. Phillips, of this vicinity, all of whom were at her bedside when she passed away. George BRUCE, a young man about 24 years of age, died last Saturday at the home of his parents in Newton township, after a brief illness. He had resided in the township since boyhood, was a most exemplary young man, be loved by his companions and held in high esteem by the entire community. The funeral occurred Monday. George BRUCE, one of our best young men, ruptured himself about two weeks ago, but did not realize it for some time, as he went to the timber for wood afterwards, and also did his regular chores. He was taken worse and three physicians were summoned but all to no avail. He lingered on and suffered until 2 A.M., Saturday, Dec. 24th when he died. The relatives were all here except Andrew who resides in Nebraska. George had numberless friends who followed his remains to the grave the funeral occurring Monday, Rev. Stahl officiating.